THROWBACK: This week, I’ll be bumping up a few posts of moderate interest from past years before we return to our regularly scheduled programming next Monday. This post originally ran the day after President Obama visited Magic Kingdom to give a speech back in January 2012. This website was relatively unknown back then and at the time, I was basically the only person on the ground offering live updates. The website basically doubled its twitter following overnight and was then probably more popular than it is now for several years. Magic Kingdom’s morning Extra Magic Hour moved from Thursday to Wednesday. Main Street Electrical Parade added to Wednesday and Friday nights. Evening Extra Magic Hours added at Hollywood Studios on Thursday. Fireworks added at Hollywood Studios on Thursday. Evening Extra Magic Hours added at Epcot on Thursday. Morning Extra Magic Hour at Animal Kingdom moved from Wednesday to Thursday. 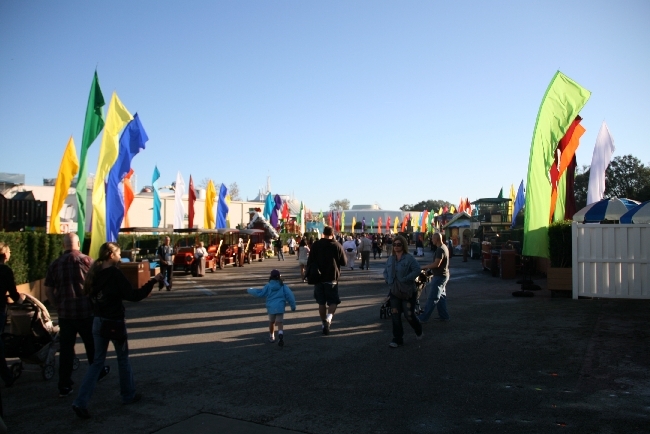 Any valid theme park admission could be used to Park Hop on Thursday to your heart’s content. You could visit Magic Kingdom in the morning and then visit Hollywood Studios later and not have to pay the $35-$55 for the upgrade. Dance Parties added to Magic Kingdom in Tomorrowland and Diamond Horseshoe in Frontierland on Thursday. So what did the day look like? Was it the inconvenience that the Internet was making it sound like? Were vacations ruined? Were children crying? The juicy details await. Here we are arriving at 8:50am. There had been some concern that security would be tightened for the President’s visit. Fact is, security was not obviously beefed up in any way. On the drive in from off-site, I saw two police cars near the area where the invited media were parked. But that was it. At Magic Kingdom, there were no metal detectors. No obvious police or secret service officers out front. My guess is that the bag checkers were instructed to be more thorough than usual, but bag check was the same as it always is. The bag checker instructed me to pull out one of my lens boxes and open it. They have eyeballed it in the past, but this was the first time they actually opened it. This was the entrance into the Park. We have the patio seating for Tony’s Town Square to the right and The Chapeau store (behind scrims) and Town Square FASTPASS machines on the left. 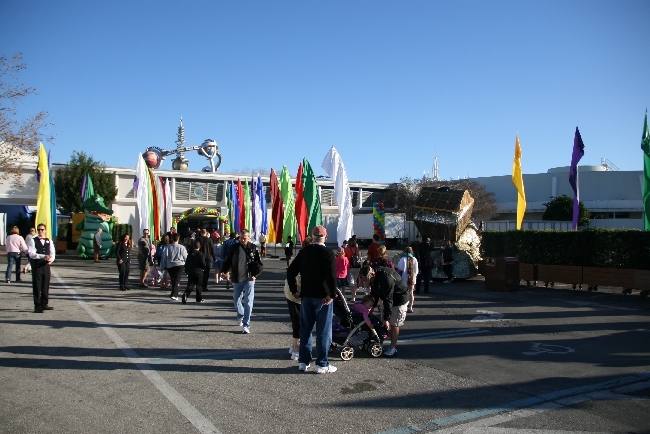 This is the “backstage area” behind Main Street. Disney did a nice job masking what is ordinarily a fairly unpleasant area. 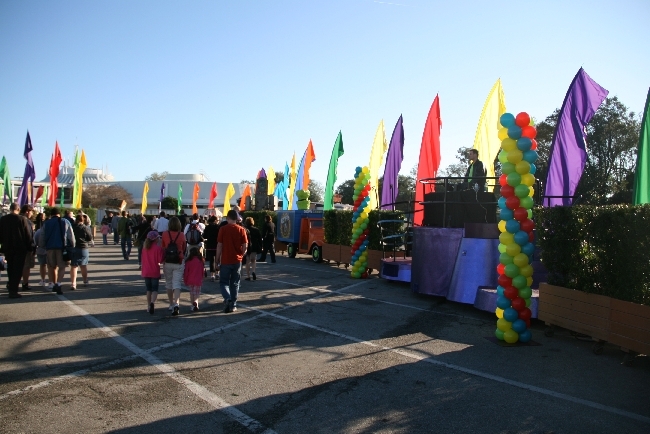 The sides of the street are lined with parade floats, Main Street vehicles, and other items of interest. The flags add a little color to what is normally a lot of grey concrete. 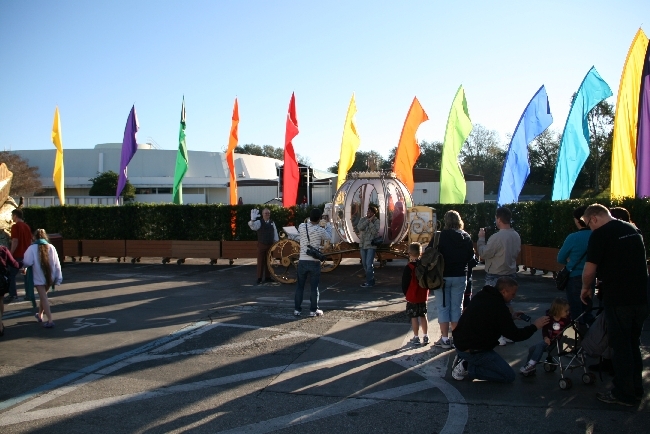 I can’t think of another opportunity to take a picture near Parade floats. Especially floats this creepy. You could pose with the carriage during Mickey’s Not So Scary Halloween Party, but that’s about the only opportunity. More flags and floats. I was excited to see that gator! It’s my favorite float! It’s not a particularly long walk back there – it takes about as much time as it would take to walk down Main Street. I was greeted by these stilt-walker-people. We’ll see them again when we visit the Tomorrowland Dance Party. Disney had set up two dance parties to help entertain guests. They are common during Mickey’s Christmas and Halloween Parties, but aren’t scheduled during regular theme park hours. Here, we have Chip, Dale, and Pluto. Lilo and Stitch cycled through. I’ve never seen Lilo in Magic Kingdom before. Later on, the stilt-people joined in the fun, often posing for pictures with guests on the ground. Winnie the Pooh, Tigger, and Goofy were also in attendance. Not sure if I would get in Goofy’s rocketship or not. I feel like not. Over at Diamond Horseshoe, Woody, Jessie, and Bullseye danced with kids. It’s a nice opportunity for kids to interact with the characters outside of the usual picture and silent handshake. I hopped on the PeopleMover to see if I could see anything of interest. Not really. Buzz had moved further back near the back of Tomorrowland, across from Space Mountain. 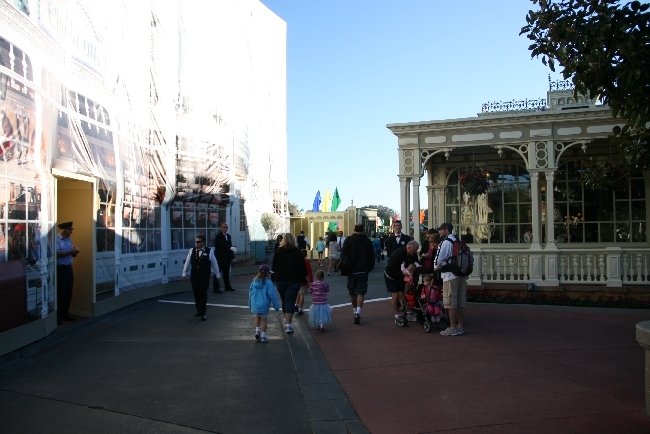 Most of the walkways over to Main Street and the Castle had several layers of security. The first line had obviously been instructed to ask guests, “Is there anything I can help you find?” That minimized the number of people lackadaisically walking near the actual barriers unnecessarily. Both Stitch and Monsters Inc. are operating here. The button cart moved from City Hall to the DVC booth. I lodged a complaint to Guest Services that there was no, “This is the closest I’ve been to a United States President at Walt Disney World” button. More barriers. This time with Cosmic Ray’s to the left and Rapunzel to the right. It wasn’t busy at all in the early morning. Virtually no one in line for Peter Pan’s Flight, Winnie the Pooh, Splash Mountain, etc. before 10am. Most everyone arrived in Tomorrowland and stayed put. We’ve got walls to the right and left of Cinderella Castle. Photopass had moved to the backside of the Castle. It’s her best side anyway. Longer wall to the left down to Rapunzel. Pinocchio moved over here to Mickey’s PhilharMagic. And Mary Poppins over to Prince Regal Carousel. Part of Peter Pan’s queue is behind this wall. The word is that it’s an interactive queue that will open the first week in March. Feeling extra patriotic? Marching through Liberty Square. Hopefully not too patriotic because Hall of Presidents was closed until the President’s departure. Not sure I would put these two bros as my last line of defense against enemies of the United States. But I digress. Another barricade here, but no wall. Over to Frontierland around 9:30am now. Pretty chill. The concrete refurbishment should begin Saturday. This is why Disney refurbishes Splash Mountain nearly every January. I counted six empty logs in a row before I got bored and moved on. Big Thunder is behind walls instead through the end of May. Captain Hook and Smee were meeting guests to the right of the Pirates of the Caribbean. Haven’t seen them together in the Magic Kingdom in a long time. There was “literally” no line. Which gives them an opportunity to have some fun. Here, they’re taunting these cast members. End of line in Adventureland. Just a rope. Checking the view from up in Swiss Family Treehouse. Can’t see much of interest. Peter Pan kickin’ it a little too close to Pirates of the Caribbean for his comfort I would imagine. Or the other way around. It’s a funny scene when he switches off with Captain Hook/Smee. The Railroad wasn’t operating until 3pm. Daisy and Donald in their standard outfits posing together in Frontierland. That never happens in Magic Kingdom. An opportunity to get your patriotic on. More patriotic. This is about as close as we’ll be getting to the President. Sup bro? Just chillin? How big is your gun? More and more Secret Service seemed to appear throughout the morning (behind the barricade). This is around 10:45am, so Mr. Obama is still about two hours out. Walking back from the front of the Park around 11am – it’s quite a bit more congested. So, in part, the purpose of Mr. Obama’s speech was to announce his signing of a bill that will make it easier for tourists to obtain visas to enter the country. I took the following pictures from Tomorrowland in succession as I turned slightly each time in a circle. Each flag you see is a foreign tourist group. But apparently it is difficult to obtain a visa to enter the country. My parents actually needed a Brazilian visa for a cruise they were going on and it was a hassle. And expensive – about $275 each. But the tour groups aren’t all South American. This is a group from an elementary school. Amusingly, Cosmic Ray’s condiments bar is being refurbished behind these walls. This sad thing you’re looking at here is a $9.39 Grilled Chicken Sandwich from Cosmic Ray’s. It comes “naked” – just bread and chicken. It’s up to you to add tomato, lettuce, mayo, etc. from the condiments bar. And they don’t do cheese like Pecos Bill, so you’re out of luck on that one too. By the time I had adequately prepared the sandwich, it had gotten cold. Just put cheese, lettuce, and some sort of sauce on it. We can do the rest ourselves if we so choose. Security was standing at each door to Cosmic Ray’s patio seating. They shifted down one door every 30 minutes. This is Bob Iger doing a few interviews. That is him, right? Here’s one with CNBC: http://finance.yahoo.com/video/cnbc-22844419/bob-iger-president-obama-s-tourism-plan-27931163.html and a full size image: https://www.easywdw.com/reports/bob_iger.jpg. I was watching the rooftops for “snipers,” thinking that the President would show shortly after they appeared. At the time, I thought this gentleman atop Casey’s Corner was brandishing a large rifle. But as you can see, he’s just a buff guy with a big set of binoculars. Another exciting moment – something caught the eye of our resident Secret Service Agent. He climbed up on this ledge and pointed his finger over at whoever it was. I would imagine you stop doing whatever you’re doing at that point. If you saw birds overhead during the speech, I have a picture of those too! Is that Ken Salazar in the baseball cap? Whoever it was is a big deal. Here’s the full size: https://www.easywdw.com/reports/is_it_salazar.jpg. Let me know if you recognize anyone else. Full size: https://www.easywdw.com/reports/big_deal.jpg. Tom Staggs? Full size: https://www.easywdw.com/reports/staggs.jpg. I’m not very good at recognizing people. 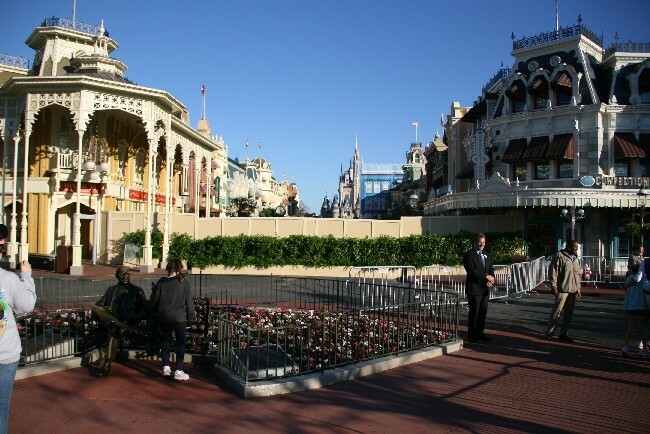 Now that more people are in the Park, the number of cast members guarding the various barriers is beefed up. They are three or four deep back there. From the other side. Looks like we have about 30 cast members and then Secret Service to put you on (in) the ground if necessary. At this point, President Obama is long gone. He was seemingly in the Magic Kingdom for about a half hour – if that. Arrived -> Speech -> Gone. Jungle Cruise was down for one reason or another. Hopefully not another accident. I got a kick out of the fact that they call this guy with a little red tool box to come fix it. By 2pm, guests were allowed in The Hub area in front of Cinderella Castle. In the back here, construction crews are disassembling the stage, flags, and whatnot. Lookin’ great. I had been standing at the Cosmic Ray’s window for about two hours to get those pictures from a little earlier. Luckily, a couple of the security officers were chatty and a couple paramedics showed up as well. One of them commented that they thought Main Street would be so clean you could eat off of it. Not recommended, but probably true. I mean, you could eat off it. But they weren’t quite ready to let people onto Main Street. At 2:15pm, Main Street was reopened. The shops and eateries opened a couple minutes later. So I took some flower pictures to bide my time. No line outside at Guest Services full of people complaining about the various delays at 2:30pm. I’ll be back tomorrow (today) with pictures of the scrims on Main Street and a hop over to Hollywood Studios for dinner and the Rock the Night Fireworks. Overall, I thought Disney did an admirable job controlling the crowds. We certainly saw some nice additional offerings to make up for the five hour closure of Main Street. I have no idea how the President ended up at Magic Kingdom to make the speech – whether the White House called on Monday and said he’d be there on Thursday or if Disney had been lobbying for it for some time. Either way, they were prepared as best they could. While we can probably agree the Main Street Wall is a little ridiculous, I don’t think the overall inconvenience outweighed some of the positive aspects of his visit. Heck, if a presidential visit brings two bonus sets of evening Extra Magic Hours, Fireworks and live music at Hollywood Studios, free Park Hopping, extra characters, and dance parties, he’s welcome at my house any time! Just a shame he said Disneyland even my 6 year old knows that it is DisneyWorld!!! I love the man with the red tool box! You’re probably too young to remember but in the PC game Theme Park the maintenance man carried a little red tool box just like that! Loving your work. Josh you are slipping. I was expecting a “big guns” pun about the sniper rather than “buff guy”. Thanks Josh. Read the whole thing. See? I read the blog. Yeah, they should have had buttons, like you said. “I got this close to the President at Magic Kingdom.” Or as he called it once yesterday, Disneyland. lol. I would have loved that dance party with the Toy Story bunch (I still need a pic of Bullseye). Just an FYI… we caught Stitch at MK when we were there the first week in March 2011. 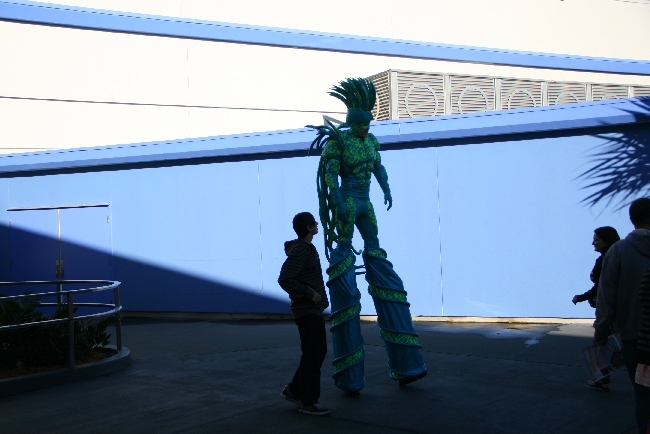 He was in Tomorrowland….across from Buzz ride I think?? Of course we didn’t realize it was an anomaly to see him there since it was our first time to bring the kids and be actively watching for Character M&Gs. We are headed back again in 44 days! Great job! A lot of fun to read. Thanks. Great on the ground reporting. It looks like Disney did a great job compensating guest whose visit was disrupted. “Not sure I would put these two bros as my last line of defense against enemies of the United States.” before I even read you comment, the guy in the picture on the right put a big smile on my face, he looked so happy ! I think Disney could make that backstage set up area that they put together for the visit, a “pay to do event”. Just put a few tables back there serve some cookies and milk, the stilt walkers, a few characters,the floats and cars, people would be all over it. Charge them $45 have a few photopass photogs. They could do it during Mardi Gras. It’s Lilo who’s never in MK, not Stitch (and Lilo was in the pic Josh posted). You can almost always find Stitch in Tomorrowland, but the shortest wait to meet him is usually just inside the entrance area at Epcot’s Future World. Great job, very fun read. Also, thanks for all the twitter updates yesterday! 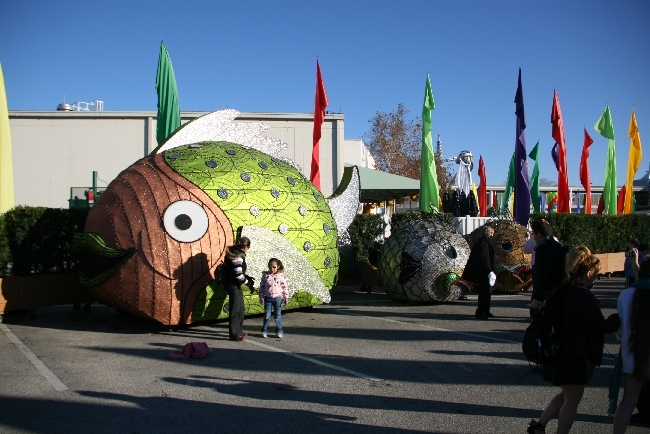 Those MSEP floats are really creepy in the daytime with no lights. I still would have been snapping pictures though. They really did a great job with that walkway. It was so plain and depressing when we used it in Dec. Glad to see that they really did a lot to entertain folks back there. Hey Josh, your tweeted coverage plus this summary is fantastic. Did want to point out that Jeff Lange has video of the speech being simulcast inside Hall of Presidents. On the screen, not lip-synched by Obama’s animatronic. I think Obama should have gotten a photo taken with his animatronic self. With all those bonuses, especially the free park hopping option, this actually seems like a much better deal for visitors than that “big announcement” for the leap year celebration – unless they add some really epic entertainment to that date also. The big dude in a few of your photos is interesting, he’s not within the acceptable weight restrictions placed on regular secret service personnel. Too bad they didn’t put the snipers anywhere you could see them, that would have been the weirdest photo – black ops and fairytale castles usually don’t mix! “The big dude in a few of your photos is interesting, he’s not within the acceptable weight restrictions placed on regular secret service personnel” but he has that stance and how he holds his hands at his side. Sort of like he is saying I could kill you 15 different ways while just using my left hand. And I have to comment on the sniper ( binocular guy), there have been some pictures of hot princesses on this blog but, he has to be one of the hottest dudes so far. Thanks Josh for taking one for the ladies. some person didnt believe the President was there – read the speech before people were let in! Seriously strange people out there! Thanks Josh for your live up to the minute reporting!! Just in case you thought you couldn’t see the snipers……why do you think LILO was there? I really enjoyed your coverage of yesterday’s goings on. Thanks so much! ARG! We are onsite and didn’t know about the free park hopping! Communication here was very bad… We didnt get any notes or anything at the resorts. If I hadn’t been tracking this website, I would not have even known he was here! I think your condiment bar pic collection is complete now! You actually got an elusive “condiment bar in refurbishment” pic! WTG Josh! I so would have loved to have been in MK that day. The kids would have been in M&G heaven with all the characters, and even Tick Tock 🙂 That’s their fav float, too. They really should have some kind of hard ticketed “back stage magic” kind of party, and set it up like that. I’d pay a few bucks to get crazy float pics and dance with some odd characters. Misty – I try to use fun words whenever possible. Chocted – I’ll give him a pass because he probably has a lot going on. Julie – I used to love that game..but I seem to remember a fatal flaw or something. Like the theme park would be completely empty after a certain amount of time, no matter what you did? Chris – Sorry, big set of binoculars will have to do. mousehelper – I’ll believe it when you pass the test. RebeccaMcK – I know!! Didn’t even get an upgrade…service is definitely slipping. Becca – Stitch is indeed easy to find. Lilo…not as much. Jane – You’re welcome! Thanks for saying so. Ana – You’re welcome! Thanks for taking the time to say so. jcarwash – Cool, I’ll check it out! Jill – Me too. Not sure what he would have done when he got there and realized he was white though. Pfalcioni – He had set up pretty early in the day, so he wasn’t with the motorcade. His official title may be something different. Peaches – I do what I can. Sandy – Someone important was definitely there. Kathy – I laughed out loud when I saw your comment. Sammy01 – Sorry to hear that – take it to Guest Relations and maybe they’ll do something for you. Brandy Bo – That condiment bar picture was the real reason I was there in the first place! You made me “literally” LOL! “the purpose of Mr. Obama’s speech was to announce his signing of a bill that will make it easier for tourists to obtain visas to enter the country.” Ah, simpler times. I remember that. We were there that week staying on site. We changed plans and went to Epcot instead of Magic Kingdom that day, but nobody told us that we could have park hopped.